Good news for The Legend of Zelda: Majora’s Mask fans: this morning (at 8am CST – WHY NINTENDO?) during a Nintendo Direct the date for the 3DS remake was announced along with a special 3DS! Isn’t that exciting. This is pretty exciting news for yours truly. After having just replayed the game late last year and it pulling me from the dark abyss, I’m eager to see the updates to this new version. If they can make Clock Town not stutter while walking through it, we can call that a success. The date for this remake is February 13. But there’s more! Of course there would also not be a bundle to go along with the game, especially after they had one for the remake of Ocarina of Time. 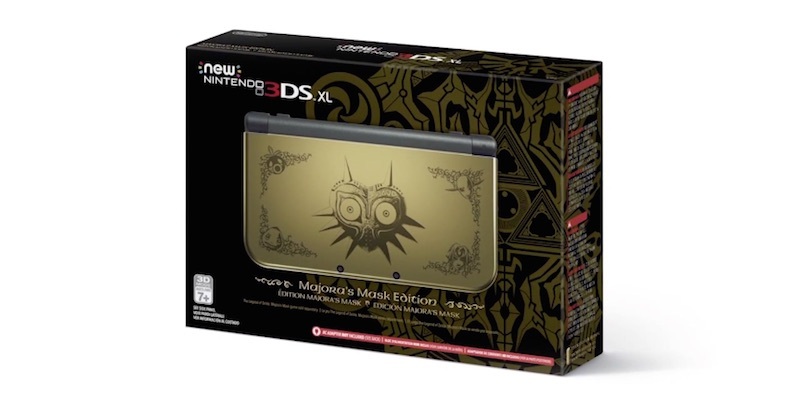 This go around it will just be one of those new New 3DS that the rest of the world has already been using for some time now but with a gold case with Majora’s mask staring at you. That sure is pretty. But if you don’t want this version with ol’ creepy-eyes on the back, you can spring for a red or black New 3DS instead and be laughed at by all your friends. Word on the street says the New 3DS will cost $199, because otherwise you’d need a Giant’s Wallet to buy it.